Entrance Mats and Floor Mats are the most effective way of stopping dirt and moisture at the door and keeping building maintenance costs to a minimum. They are also effective internally in high traffic areas or at service/wipe-off regions. Ordering a custom logo mat is as easy as 1-2-3. Our logo mats are among our most popular products. Beautifully crafted with vibrant colors offers the best high impact decor with unparalleled floor protection. 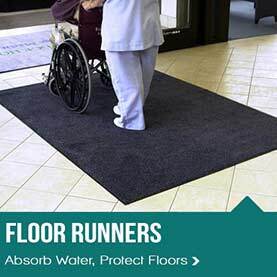 Floor Mat Runners are designed to provide safe footing with minimum movement. Ideal for numerous production locations, walkways, gym floor protection, parts counters, lab areas and food service applications. Anti-Fatigue and Cushion Mats are available in a wide range of sizes, weights and materials. Anti-fatigue mats can enhance worker productivity by over 20%. Designed to eliminate muscular skeletal disorders. Kitchen Floor Mats are a key essential to productivity in your restaurant or home. Reduce stress with anti-fatigue mats or prevent slips and falls we have you covered. Easy to clean and maintain these products won’t crack or curl. Interlocking Mats / Tiles or Modular Mats allow you to set up, take down and reset up your matting configuration. Interlocking mats are ideal for gyms, fitness rooms, event and trade show booths that need a little foot relief! Heavy Duty Mats designed for high impact in gyms, fitness centers and weight rooms. A variety of products offered to meet your desired fitness flooring needs. Message Mats are designed to give employees or customers a message, warning or caution. Great for safety and providing instructions. Available in all rubber, Waterhog pattern and a poly wiper mat. Health Clubs, Showers, Spas, Swimming Pools, Saunas and Jacuzzi areas have a lot of barefoot traffic and water. Having the right mat that is easy to clean and allow water to flow through reduces the risks of slips and falls. Garage mats help keep your floors clean and provide superior protection to your floors. Great for man caves, showrooms, tradeshows, auto shops and residential garages. Applications require anti-fatigue relief while working with delicate circuitry or components. Work environments where static discharge can be a hazard; refineries, paper mills, printing, laboratories. Waterhog mats are the most popular and widely used mats on the market with its bi-level construction this mat is the most effective way to remove debris from shoes. 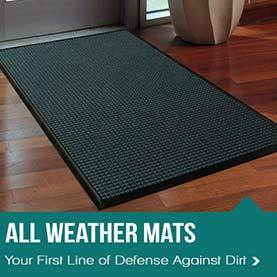 Offered in a wide range of sizes and colors this heavy-duty mat will last for years. Medical mats designed for clean rooms, medical labs and health care facilities provide safety to guests in the building while and offering anti-fatigue properties to employees for long standing hours. Keeps facilities cleaner where needed. Residential entrance mats, door mats, entry mats, carpets and rugs for various uses around the home or housing complexes like condominiums, apartments and housing communities. Enhance the look of your home with one of our unique designs. Custom Personalized Doormats are a great addition to your home or office. Not only are they great housewarming gifts and holiday presents they are great for your pets too. Make an impression with one of our personalized home decor mats. Soil is everywhere! Today's emphasis on Green Cleaning and the impact of the cleanliness of a building on health makes soil management even more important. We recommend a minimum of 10-12 feet of high quality entrance floor matting as part of a Green Cleaning program. Entrance floor mats may also be scraper mats that provide the first line of defense against soil. Scraper entrance mats should always be used along with wiper & finish entrance mats that provide wiping properties to remove fine soil and water from feet. Mat Rentals vs. Purchase - Do You Know The Facts? We're serious about our role as an innovative product supplier to the commercial market. As such, it is our responsibility to educate our customers about the environmental benefits of "green" cleaning!